You can forget the baubles, Santas, and gingerbread men. 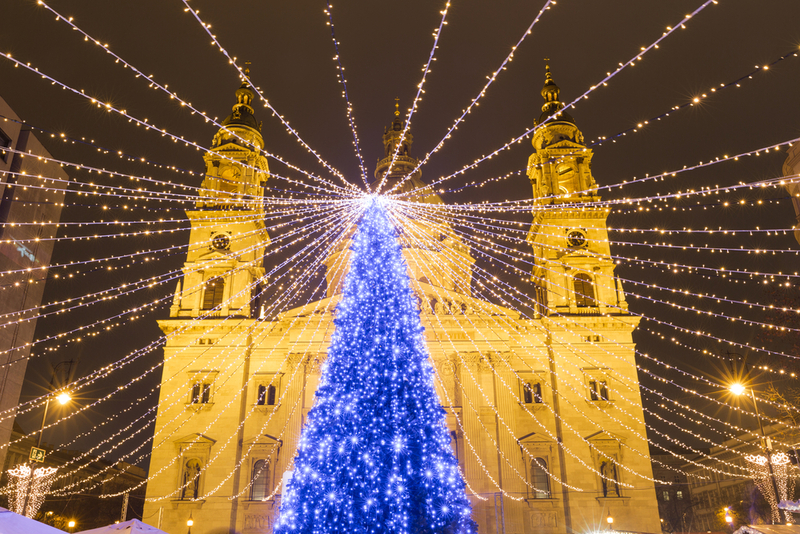 After a few glasses of gluhwein, Jane Archer sees the festive season in another light on a cruise along the River Danube. You know that feeling when you realise things aren’t quite going to plan? So there we are, scrambling down a rocky path in the pitch dark, wondering whose idea it was anyway to go in search of the castle in Durnstein where Richard the Lionheart was held captive in 1192. True, the family had come away to escape the boring TV, turkey and tinsel routine but when I suggested livening things up by going on ariver cruise I was thinking more of a gluhwein or two in Europe’s famed festive markets and sociable evenings in the lounge, not risking life and limb in search of a serial crusader. In fairness we had enjoyed plenty of both gluhwein and socialising since joining Viking Skadi, one of Viking River Cruises’ Longships – yes like the one in the ad that until recently book-ended every one of ITV’s crime dramas. The journey would take us from the German town of Passau on a leisurely seven-night cruise along the Danube, through Austria, Slovakia and into Hungary, finally disembarking in Budapest. At each stop Viking provided free guided tours, which we joined now and then (as they don’t cost extra so you can dip in and out as you want), but mostly we did our own DIY tours, which all seemed to end at a Christmas market. These are colourful affairs, packed with stalls selling all sorts of Christmas goodies – things to hang on your tree, polished wood souvenirs, chocolate Santas, gingerbread and more – that must be seventh heaven for festive folk but bring out the “Bah Humbug” in me. 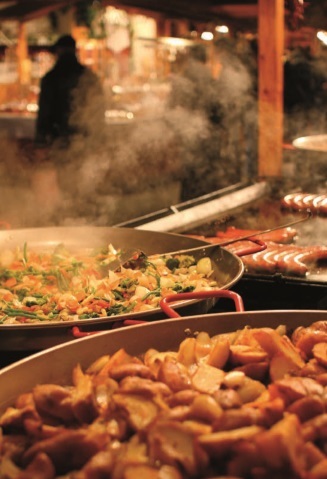 What I love about these places, aside from the sugary donuts, bratwurst and steaming hot gluhwein, is the cheery atmosphere as families, couples and groups of friends imbibe the Christmas spirit – literally! Passau turned out to be a pretty place with a splendid cathedral, cute cobbled streets and an unfortunate tendency to flood due to its location at the confluence of the Danube, Inn and Ilz rivers. A marker on the Town Hall shows the water level in June 2013, when the river rose almost 12 metres and the town, and others along the Danube, was drowned. As we were docked in Passau overnight we had time to go cycling – there’s an easy bike path along the River Inn – and joined a tour that visited St Stephen’s Cathedral, said to house the world’s biggest organ, before joining the Christmas revellers in the market. Next day, as we joined the cruise director for a welcome aboard talk and toast, the captain slipped the lines and we headed east, next stop Linz in Austria. Viking took the river cruise market by storm when it launched its first Longships in March 2012 – not just thanks to their modern design (cabins with balconies and Scandinavian décor, which was such a change from the living room-look of old) but because the company launched six in one year. They followed up with another 10 the next year and launched 14 more this year. The numbers are astonishing, but so is demand. By the time I booked in early September the Christmas cruises were all but sold out. Our fellow passengers were mostly from North America, and they were great company over lunches and dinners. Meals are open seating, which means you can sit with different people, and they are served with complimentary wine, beer or soft drinks, which added to the festive feel. In Linz, we joined a tour to Salzburg, famed as the city of music as it was the home of the singing Von Trapp family and Mozart. It’s a two-hour drive in each direction, which is a bit of a haul but there’s not much reason to stay in Linz, while Salzburg is a beautiful city. We took a funicular to the imposing Hohensalzburg Fortress towering over the city and treated ourselves to tea and strudel at the oldest coffee house in Austria, an elegant establishment where Mozart was once a patron. We also tasted Mozartkugeln (Mozart chocolates), saw the house where the man was born and the odd array of souvenirs he has inspired, from rubber ducks to cigarette lighters. Salzburg certainly gets its money’s worth from its most famous citizen. Next day, as everyone back home was opening their presents, peeling sprouts and basting turkeys, we joined an excursion to a magnificent baroque abbey in Melk, sailed through the picturesque Wachau Valley and, as darkness descended, set out on our DIY tour to find Richard’s prison castle. Not that Christmas went unnoticed. That evening, the port talk (a run down of the next day’s highlights held before dinner each evening) was interrupted by a sack-carrying Santa bearing gifts for all, and dinner was a festive six-course feast of veal carpaccio, chestnut soup, lobster, beef, cheese, all rounded off with poached pear in cassis. Food had become something of a theme, I realised, as next day in Vienna we ordered coffee and sachertort at the Sacher Hotel (a real treat, just don’t look at the prices!) and then made our way to the baroque Schönbrunn Palace, the summer residence of the Habsburgs who ruled the AustroHungarian Empire until the end of the First World War. I’m sure inside is wonderful but I confess we were waylaid by – you’ve guessed it – a Christmas market in the grounds. 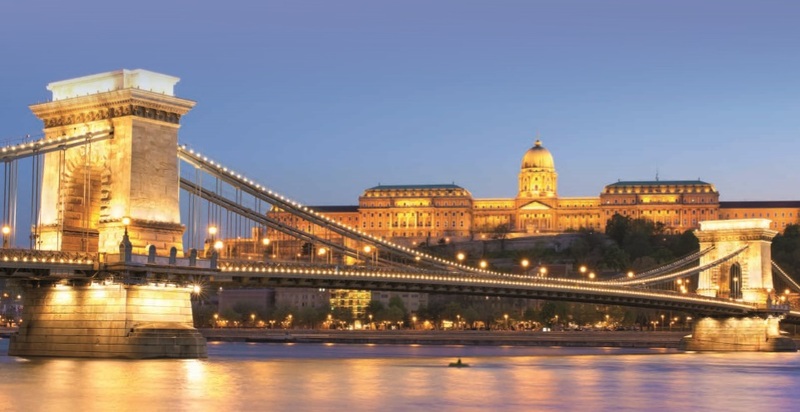 After a quick stop in the Slovakian capital of Bratislava next day (small but sweet with quirky statues), we glided into Budapest at 10pm, cruising between the twinkling lights of the city on the Buda and Pest sides – just as they do on that TV commercial – before mooring for the night. I first visited the city in Communist times, when the very few restaurants had a couple of dishes if you were lucky (but usually not the food listed on the menu!) and life was drab. How it has changed. These days it is packed with restaurants and cafés, and life is fun, with walking, bike and Segway tours. We did one, weaving in and out of the crowds of people at the market before warming up with a final gluhwein or two before our flight home next day.